The Logistics dropsuit is outfitted with the latest in integrated diagnostic technology, most of which revolves around maintaining the condition and efficiency of squad mates and their equipment. 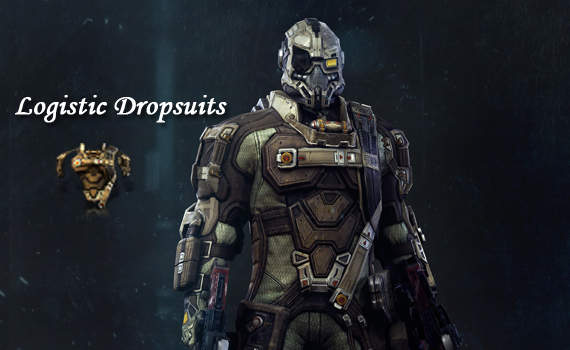 As such, a soldier equipped with this class of dropsuit becomes a force multiplier, greatly improving the overall effectiveness of the unit. Utilizing a combination of high- and low-tech equipment, operators of the logistics suit are able to make effective repairs to installations, vehicles, and even other soldiers; every apparatus required for field triage is present and easily accessible from the utility pockets and satchels attached to the suit. Its hydraulic assisted exoskeleton allows the wearer to effortlessly hoist heavy equipment, while the helmet is packed with material scanners sensitive enough to spot microfractures in layered steel. When deployed, a soldier equipped with a Logistics suit fills a vital tactical role in small unit operations and full-scale warfare, providing both, medical and mechanical support. No-one understands the complexities of the battlefield better than those who choose to walk the line between healer and murderer. Mercy and death are often one and the same, and those who wear this suit understand that both can be granted with a bullet. Patterned after the uniform worn by Group-5, a regiment of first responders who lost their lives when the plasma wave struck Seyllin I and destroyed the planet, those who wear this suit pay tribute not just to them, but to all who lost their lives in one of the darkest moments in New Eden’s history.